Tracksounds: Gotcha! The End - Tracksounds to Shut Down. Gotcha! 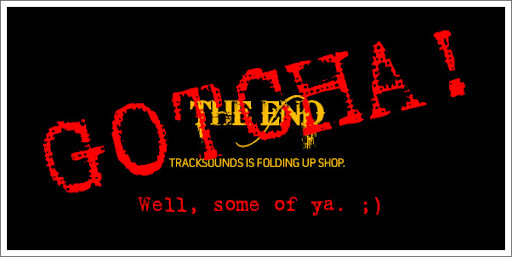 The End - Tracksounds to Shut Down. GOTCHA! Well, some of ya. Of course some of you figured out my little April Fools prank, but admit it, some of you wondered if it was true at least a teensy weensy bit. I was just hoping to be the first April Fools Prank you saw on the web this year, because after you've experienced one joke...you're keen to the rest. Mine was the Star Wars film prank from The Movie Blog. Really had me going for a few minutes. I only get to do the "Our site is shutting down" prank once in a lifetime, so there you have it. Will have to come up with something a little more subtle for another year. Thanks to all of those who sent me emails and IMs. Glad to know the site means a little something to you. To those of you who were dancing a little jig at my announcement. Sorry...Tracksounds ain't going nowhere...as far as I know. Truth be told, there are some good things happening with some good people getting involved. You'll be seeing the effects of this in the upcoming months. There's so much to do and so little time. I guess this is a great time to plug our Team Up page. Check it out and let me know if you have any interest. So...some 21 hours after posting my little joke, I say 'HAPPY APRIL FOOLS DAY' to you all. Thanks for visiting and supporting Tracksounds all these years. Tracksounds has been online since 1998...really 1997, if you count the original Geocites site! While there are a ton of things left on the table for this site and the vision far from being fulfilled, there have been a number of very recent events that have come together to make it impossible to continue to run Tracksounds. Some of the reasons are very personal, some not, so I'll share what I can. First off, the current economic climate has forced me into taking a few other projects that are going to dominate my time, like nobody's business, over the next couple of years. Secondly, my recent engagement is going to eat up what little time I have left...but happily so! I was hoping to keep Tracksounds alive by handing the reigns over to some very capable individuals...much moreso than myself actually, but in the end, the right setup for all parties just couldn't be reached. I believe it to be in the best interest of everyone that Tracksounds simply close its doors. The site won't disappear immediately, but over the next few months you'll fewer and fewer updates. I haven't decided whether to leave the site up just for reference's sake. We'll have to see there. I'll definitely still be floating around the net and looking for a new soundtrack home myself. It will quite strange just being a "visitor" again. Seems like yesterday that sites like Filmtracks and SoundtrackNet inspired me to start my own site. Hopefully Tracksounds did the same for a few others along the way. So...enough of that for now. It's a little depressing having to post this at all. As my own thoughts clear, I will post more. Thanks for all of your support over the years. I've met and worked with some great people and look forward to continuing those relationships. HA! Brilliant April Fool's joke, Chris!! Sorry though, I wasn't fooled for a minute. This site is awesome and I don't even want to think about it shutting down. All my best! Keep up the awesome work, man!! don't fool me, or I'll cry!